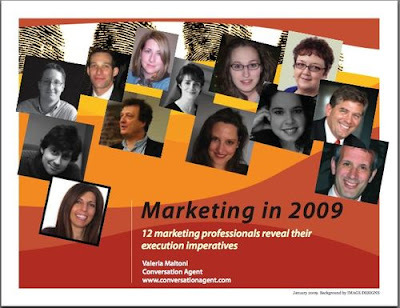 Valeria Maltoni, who writes for Fast Company (among others) has put together a free eBook called Marketing in 2009. It features some very smart people in the business. And me. You can read a description of it here at Valeria's blog or, if you're one of those people who figures that any book with Alan Wolk in it is worth downloading (e.g. a member of my immediate family) you can get it here.